"Some of us standing here could have been one of these flags but for an intervention," says one veteran. 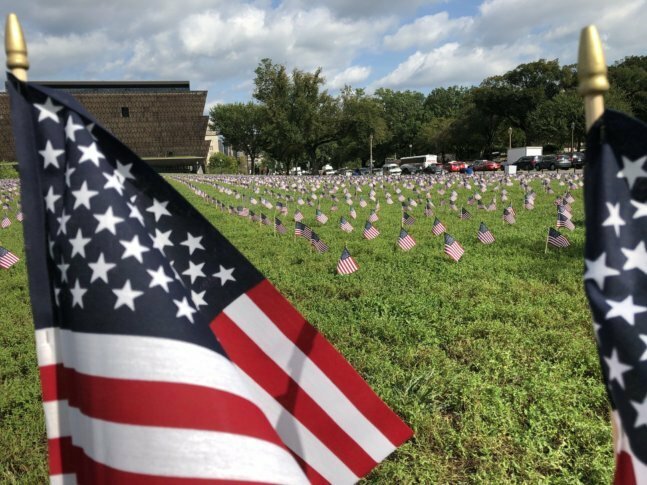 In all, 5,520 postcard-size flags were planted on a patch of grass between the Washington Monument and 15th Street to represent veteran suicides occurring in 2018 through Wednesday. WASHINGTON — Planting what eventually looked like a carpet of fluttering American flags, veterans groups were on the National Mall Wednesday to raise awareness about veteran suicides. In all, 5,520 postcard-size flags were planted on a patch of grass between the Washington Monument and 15th Street to represent veteran suicides occurring in 2018 through Wednesday. A single line of larger flags represented 20 daily losses of veterans to suicide. “Sixty-five percent of us know someone who has attempted suicide; 58 percent know someone who has died by suicide,” Bryant said. Also speaking at the event was Rep. Mark Takano, a Democrat representing California’s 41st District. Citing a federal report released in September, he said veteran suicide is a serious problem with no clear end in sight. “It also points to new alarming statistics indicating that veteran suicide rates among young veterans ages 18 to 34 are on the rise,” Takano said. Noting the year-over-year rising trend, Bryant called veteran suicides a public health crisis that reflects what’s happening in the broader community. “We need to de-stigmatize and allow for better mental health care to be provided for citizens everywhere,” she said. Bryant cited Tuesday’s news that Jason Kander, a former Army intelligence officer who served in Afghanistan, was dropping out of the mayoral race in Kansas City, Missouri, to get treated for post-traumatic stress disorder.